Few members of Egypt’s street protest movement for political reform are as recognizable as Nora Younis. Since Egypt’s troubled period of political opening began in 2004, she has made her mark both online and in the street with visual flair and persistence. In October, the New York-based Human Rights First charity gave her one of their annual awards for courage. As the author of a self-titled political blog, www.norayounis.com, she broadcasts her demands for democracy and human rights. And as a fixture in the street protest movement, she became known in the country’s media as the curly-haired girl holding photographs of the Interior Minister and a police commander accused of sexually assaulting her and 30 other women, demanding their arrest and trial. But Ms. Younis never set out to be an activist. When the government began opening the political system in 2004 by allowing challengers to run against President Hosni Mubarak, she was an underemployed translator. “If you can’t impose a different reality through elections and public referenda, and it is not safe for people to politically engage, participate, and express themselves, then what are you left with?” she asks. 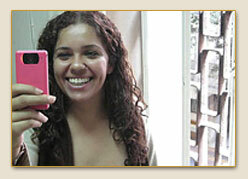 Younis thinks that new media technologies like blogging and digital video may be Egypt’s best hope. “New media can bring people together, build consensus, and try to maintain the free space we have been given” during the political opening of the last several years, she says. 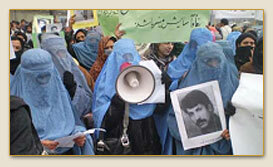 Several hundred women, many holding aloft pictures of relatives killed by drug lords or Taliban militants, held a loud but nonviolent street protest in December, demanding that President Hamid Karzai purge from his government anyone connected to corruption, war crimes or the Taliban. Nora Naraghi is barred by her gender from taking a motorcyle out on Iran’s roads, but has defied discrimination to become the country’s motocross champion. Born into a family of motorcyclist enthusiasts, where motocross biking is a part of everyday life, Nora was prevented from obtaining a motorcycle licence, so she hit the sandy trails instead. Nora says the track at Azadi stadium, Tehran’s main sports complex, is off limits for women, and that this lack of available tracks is the main hurdle for women getting ahead in motocross. “We do not have a place to train like a permanent track, so we go to the hills in north-western Tehran, which my father has set up with basic technical requirements,” she added. 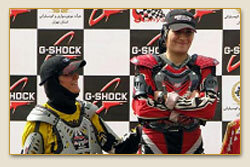 Nora’s dream is to promote motocross among Iranian women, and to compete beyond Iran’s borders. “My mum and I, as pioneers of this sport in Iran, want to spread it as an exciting sport for all through the Xanyar club, where both of us are in charge of training women. I am currently training three other women. A lot of women do not know that this sport exists,” Nora said. For many years, photojournalism in Palestine was the exclusive domain of men. Women were largely restricted to only taking pictures of weddings and social events. Recently, Palestinian women have burst on the photojournalist scene challenging these social norms, while receiving accolades for their work abroad. One photojournalist, Eman Jomaa, winner of the Creative Women in Palestine 2009 prize, describes the magnificent feeling when standing behind the camera - “A feeling of joy mixed with challenge to the society which has refused the presence of women in this field,” which Jomaa says is due to Gaza’s cultural and social inheritance. Jomaa says that if Palestinian women, like the operative Leila Khaled, can bring down an Israeli aircraft, “They can definitely carry a camera and point it towards the occupation,” and other more sensitive internal issues. “Photojournalism is a mission to defend the nation and the people through a lens,” she said, adding that she stills plans to extend her reputation on both the local and international photography scenes. "I believe words are stronger than guns... It is words that start revolutions and changes." In a country where women’s voices are rarely heard, the Afghan Women’s Writing Project, a pioneering blog, represents a tentative step forward in addressing the lack of female voices in the public sphere in Afghanistan. Its contributors take enormous risks in writing - publishing anonymously on topics (ranging from contemporary politics to considerations of the burqa) to avoid being identified. The project – an enormous success - was set up by American novelist Masha Hamilton as a way for Afghan women to share their experiences directly with the rest of the world, rather than being spoken for by men. Women’s political participation in Algeria, Morocco and Tunisia is to be enhanced under a new United Nations-backed project launched today for an innovative website to provide them access to information, the exchange of experiences, ideas and good practices. The project - Strengthening women’s leadership and participation in politics and decision-making in Algeria, Morocco and Tunisia - is being implemented by the UN International Research and Training Institute for the Advancement of Women (UN-INSTRAW) and the Tunisia-based Centre of Arab Women for Training and Research (CAWTAR), which promotes gender equality in the Arab World, and is financed by Spain. Speaking at the Third Conference of Saudi Writers in Riyadh last Monday, Dr Abdul Aziz Khoja, Minister of Culture and Information, stressed the ministry’s support for writers and intellectuals across the Kingdom. He added that the government respects the views of the country’s writers. “We always listen to the intelligentsia and the opinions they raise, especially the ones touching on our beloved country. Dr. Lamia Baashan, a renowned critic, who also addressed the conference, described the participation of Saudi women at the conference as “historic”. “By all standards and measures, the presence of Saudi women at this conference represents a qualitative leap,” she stated. She also expressed hope that Saudi women would have a greater and more effective presence at the next conference and other such events.